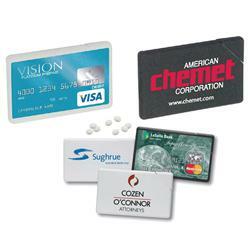 Mint card or credit card mints, Sugar free mints in a plastic mint card dispenser shaped like a credit card. 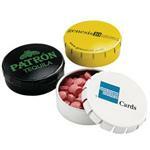 These breath freshener mints are the perfect gift and come in either a black or white case. 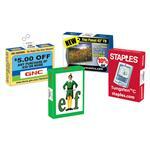 Printed with a high gloss laminated four 4 color process label with full bleed or direct imprint. With full color magazine quality printing it makes a gorgeous presentation. 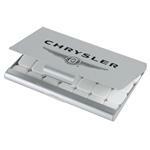 Add your full color imprint and make this your handout for real estate, mortgage companies and home shows. Email the friendly customer service people at sales@adcomarketing.com for help with artwork! Production Times Available: 5 working days standard. Free 3 day rush production. Typical Imprint Area(s): Decal: 2.8" x 1.6"
Available Imprint Options: Your full color logo printed on a decal (scratch resistant, laminated) or one color direct printing.